I wrote the following piece for the local Driggs paper this week. Since most of you don't receive that, I thought I'd go ahead and make it my blog entry for the week, as well. It's a bit longer than most of my entries, but I'll break it up with photos. Happy Summer, and enjoy! 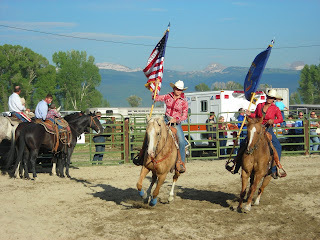 My wife Joanne and I just experienced our fourteenth Fourth of July here in Teton Valley, and as part of the celebration we attended the Tetonia Rodeo. 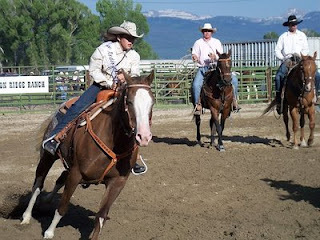 It was fantastic as a rodeo, even better as a representation of life in Teton Valley, and ultimately felt like a panacea for local ideological differences. What a great event. Since moving to the valley, Joanne and I have worked our share and also enjoyed a variety of recreational activities. These pursuits have introduced us to amazing people and priceless adventures: mountain biking, hiking, skiing, snowmobiling, softball, fishing, floating, golfing…and horses. Ahh, horses. 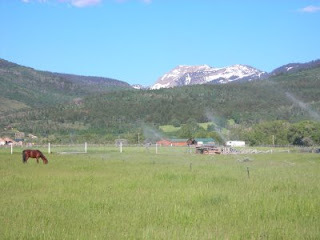 You don’t just roll over in the morning and ride horses, and therein lies the beauty. 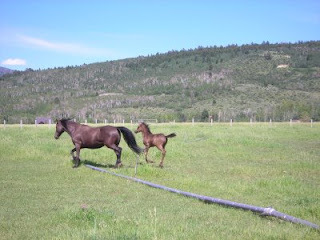 You move the sprinkler pipe to grow their pasture, build barns and fences to shelter them, buck their hay, feed them, muck their stalls, train them, shoe them, brush them, soap their saddles, and watch them frolic. You get thrown a time or two, but get back on and gradually form a partnership based on mutual respect. The good ones transport you to places and feelings you’d never encounter otherwise: stunning high country vistas, crystal clear creeks, time with your thoughts, the sound of wind and hawks, Dutch Oven meals, starry campfire nights, and lifelong friendships with likeminded souls. Horses engender resourcefulness, accountability, self-reliance, cooperation, work ethic, preparation, trust, responsibility, and common sense. Each of these traits seems to be vanishing from our world at large, but each was evident in abundance at the Tetonia Rodeo on Saturday. It was remarkable to witness. 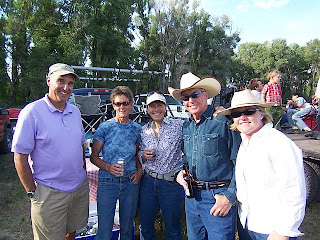 We stood amidst valley newcomers, old timers and in-betweeners, all enjoying the same event, good conversation, tailgate refreshments, and an incredible Teton sunset. Some wore cowboy hats, others fishing hats; some sported cowboy boots, others sandals. All had big smiles. Fred the emcee reeled off one hilarious western quip after another. Kids chased calves and busted mutton. Roping, Barrel Racing, Bronc and Bull Riding showcased longtime valley names like Hill, Breckenridge, Ripplinger, Kaufman, Cooke, Beard, Barney, and Rammell. Pee-wee class participants gritted their teeth and competed, some of them barely of school age, sixty pounds of human determination somehow handling 1,000 pounds of aggressive horse. Dirt flew, newcomers cheered, respect and wonder beamed from all eyes. The equestrian spirit has thrived in Teton Valley for generations. Before jeeps, mountain bikes and ATV’s, there were horses, and we owe most of our mountain trails to this fact. 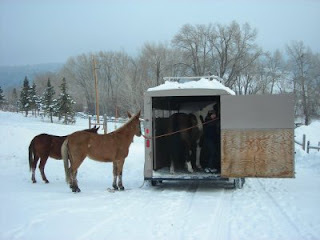 The horse has been the lynchpin of ranching, farming, herding and hunting. It is a lifestyle that emphasizes similarities before differences, and represents authentic Western America, right here beneath the Tetons. We would be wise to preserve such heritage. As the rodeo ended on Saturday and the crowd began departing, an east coast native and new valley friend approached me. He pointed out several kids in cowboy hats playing in the arena, and presciently remarked: “what a wonderful way for kids to grow up today.” And yesterday, and tomorrow.